Rum and chocolate, Italian style. A unique chocolate served with immense style. Cunesi are rum and chocolate truffles, each massaged until it's as smooth as silk. A single cunesi just barely fits in your mouth. 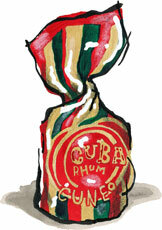 The chocolate pops and cracks and the rum seeps through the flavor, down your throat like molten lava. Packaged in sleek red boxes. From Venchi, our long-time supplier of Hazelnut and Chocolate Spread from Turin.